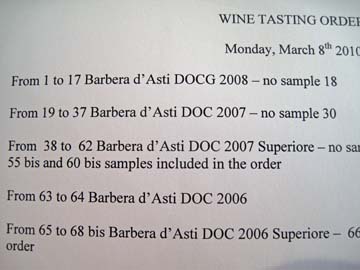 The third set of notes: barbera d’Asti Superiore from 2007. See this post for important disclaimers. Agostino 2007 Barbera d’Asti Superiore Moliss (Piedmont) – Bark and dill, chewy dark fruit, fine particulate tannin, and graphite. Except for the weirdness on the nose, this could actually be a good – albeit dark – wine. Boeri 2007 Barbera d’Asti Superiore “Pörlapà” (Piedmont) – Very fruity. It’s black, concentrated fruit, in fact, chunked up by seeds and stones, then slathered with tannin and vanilla. Finishes thoroughly brutalized by its élevage. Boeri 2007 Barbera d’Asti Superiore Martinette (Piedmont) – Dark, dark, dark…fruit, wood, acorns, leaves, bark, nuts. Is there some salt here, as well? Very odd. Tastes like Barossa shiraz, albeit lighter. Cantina Sociale Barbera dei Sei Castelli 2007 Barbera d’Asti Superiore Le Vignole (Piedmont) – Lavish, satiny fruit. Dark and gelatinized. Texturally mouth-coating, but finishes with more of that thick vanilla miasma that’s ruining so many of these wines. Cantina Sociale di Mombercelli “Terre Astesane” 2007 Barbera d’Asti Superiore (Piedmont) – Milkshake. Pride-like (the winery, not a group of lions) in that, with blueberry and milky, malted chocolate well-evidenced throughout. So, so anonymous. Sant’Agata 2007 Barbera d’Asti Superiore “Altea” (Piedmont) – Full-throated fruit crying out for succor in a dark and seedy alleyway. Concentrated. Actually not bad at all, for a fruit bomb. Boom! Sant’Agata 2007 Barbera d’Asti Superiore “Cavalè” (Piedmont) – Absolutely identical to the same winery’s “Altea” but with the addition of a pleasant, minty complexity. Very good in this style. Castlet 2007 Barbera d’Asti Superiore “Passum” (Piedmont) – Mint. All mint. Mint tea, mint leaves, dried mint. But nothing other than mint. Pastura “La Ghersa” 2007 Barbera d’Asti Superiore “Muascae” (Piedmont) – Chunky black fruit, good acidity, lots of tannin, dark chocolate. I’m losing my ability to perceive wood or its absence in these wines, so I can’t tell if there’s any here, but the goopy chocolate (a bad thing) never goes away. Pastura “La Ghersa” 2007 Barbera d’Asti Superiore Vignassa (Piedmont) – Dark fruit and – making a reappearance after a long absence – dark soil as well. But it’s all in the service of a chocolate/cherry layer cake. There must be good material here, but it’s being partially obliterated. Castello di Razzano 2007 Barbera d’Asti Superiore Vigna del Beneficio (Piedmont) – Very dark fruit ranging into the cassis realm, with some intrusive brett and spicy wood notes, plus coconut. And chocolate. Again. And again. And again. Cocito 2007 Barbera d’Asti Superiore Violanda (Piedmont) – The fetid stank of horrid, diseased wood. Spoiled candy. One of the worst noses in a quality, non-experimental, or homebrew wine I’ve ever experienced. Pure candy on the palate. 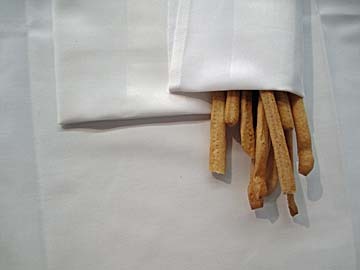 Pixy Stix are more authentic than this. They taste better, too. Elio Perrone 2007 Barbera d’Asti Superiore Mongovone (Piedmont) – Heat, brett, chocolate, rum. Lament for what’s been done to this wine. Dill, spinach, cocoa, espresso. Lament, lament, lament. Trinchero 2007 Barbera d’Asti Superiore “Rico” (Piedmont) – Back to normal, everyday internationalizing…full fruit, mixed chocolates, Fruit RollUps. Spiky/spicy acidity on the finish. Araldica “Il Cascinone” 2007 Barbera d’Asti Superiore “Rive” (Piedmont) – Armpit and crotch. Yes, I just wrote that. No good at all. Ivaldi 2007 Barbera d’Asti Superiore “1613” (Piedmont) – Jam and Nutella on toast. Very short. You’d think that if one is going to do this sort of stuff to a poor, defenseless wine, one would at least supply a finish. Then again, maybe that’s a blessing here. Marchesi Alfieri 2007 Barbera d’Asti Superiore “Alfiera” (Piedmont) – Good, solid fruit. Thick structure, dense with tannin and chocolately oak. Milkshake and wine coexist here, which isn’t entirely bad for those who like that sort of thing. dei Fiori 2007 Barbera d’Asti Superiore “Rusticardi 1933” (Piedmont) – Chocolate, dark berry, mint, and some earth. Gravelly. A really sophisticated, polished wine with a pretty fair structure. It’s not my style, but still, I have to admit that I kinda like this one. It’s got class. Il Falchetto 2007 Barbera d’Asti Superiore Bricco Paradiso (Piedmont) – Mint & rose hip jams, tangy. There’s a chewing gum element here that I can’t quite decide if I like or not. Finishes high-toned and herbal. Some eucalyptus, as well. Il Falchetto 2007 Barbera d’Asti Superiore Lurëi (Piedmont) – Menthol grappa, kirschwasser, and detergent. A world of no. Edited to add: tasted at the winery a few hours later, this will be the best wine I’ll taste all day, so what I’ve written here absolutely must reflect a damaged bottle. Or a damaged taster. Maybe both. La Fiammenga 2007 Barbera d’Asti Superiore “Paion” (Piedmont) – Flat-aspect fruit, low-ebbing and dull. Seems tired more than anything else, as if the fruit is simply fatigued after being subjected to overt effort. La Meridiana 2007 Barbera d’Asti Superiore “Tra la Terra e il Cielo” (Piedmont) – Lavish dark fruit in whole-berry, jam, and jelly form, with tannin and a hard shut-down of wood on the finish. Starts showily, but ends unpleasantly and in complete disarray. La Pergola 2007 Barbera d’Asti Superiore Cappelletta “Vigne Vecchie” (Piedmont) – Chunky. Lacquer and paint with a varnish of…no, sorry, I can’t bear to continue. It’s just not worth it. da Vino 2007 Barbera d’Asti Superiore “La Luna e I Falò” (Piedmont) – When I was a kid, I used to mix the bobbing remnants of Count Chocula™ and Frankenberry™ in my breakfast bowl, so as not to waste the yummy sugary fakeness. I survived without becoming a diabetic, to end up here…drinking the exact same thing. Vinchio-Vaglio Serra 2007 Barbera d’Asti Superiore “Vigne Vecchie” (Piedmont) – Tedium in the form of overworked dark fruit. Wood and tannin, tannin and wood.